Liz Adair’s new Spider Latham Mystery, Trouble at the Red Pueblo, captures the mystery and splendor of the red rock country and modern spirit of the west. In a style similar to that of Tony Hillerman and Clair Poulson, she mixes a solid mystery with a modern western. 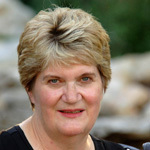 It has been ten years since her last Spider Latham Mystery, but she has plans to write more of them in the near future. In this latest venture, Spider is sent by the part time agency he works for when he’s not acting as a Lincoln County deputy sheriff, to Fredonia, Arizona, to straighten out some problems at a small museum. It doesn’t take long to discover someone has organized a campaign to bankrupt the owners so they’ll have to sell their nearby ranch which boasts a natural spring and would be a great location for a housing development. Further study reveals a pattern of this type of action to acquire development property. Museum Director Martin Taylor suffers a collapse due to stress and his son, Matt, is an angry man with a temper who recently broke up with his fianc and is now dating a polished city girl. The former fianc is an employee of the museum and is also dating someone new, a land developer. There’s also an older couple who work at the museum. Laurie, Spider’s wife, accompanied him on this trip and is a little too cozy for Spider’s peace of mind with her fourth cousin, Jack, who has a large nearby ranch and who is an orthodontist. Complicating Spider’s life more is Karam Monsour, a Palestinian from Dubai who is drawn to Spider’s orange Yugo and is stuck in town waiting on repairs to his E-type Jaguar. Spider is deeply involved in studying the fraudulent charges brought against the museum and other shady deals when a murder occurs and there’s a plethora of likely suspects with strong financial and emotional reasons to want the victim dead. Spider is far from the typical Western literary hero. There’s an honesty and realism to him that real westerners will recognize and love. He’s not a twenty-something quick-draw, but a man who has raised two sons, loves his wife, and values the land his ancestors settled as early pioneers. He’s a deputy sheriff who isn’t paid too well and has difficulty figuring out modern electronic gadgets like smart phones. He’s kind and compassionate to family, friends, strangers, and animals, but struggles to deal with assumptions and jealousy. His manner of speech and his thought processes ring true and endear readers to him. Spider’s wife, Laurie, is a strong woman in many ways. She has a kind, gentle style that draws people to her, but she also has a keen mind and is in many ways as much of a detective as her husband. She’s also knowledgeable concerning horses and western culture. Other minor characters are strong, distinct people who greatly enrich the story. The background for this story is the Utah/Arizona border area between Kanab and Fredonia with its red rocks, high temperatures, and Anasazi ruins and artifacts. Adair does a great job of bringing this setting alive as part of the story, making visualizing the magnificent scenery easy yet a natural part of the story. The cover is a beautiful shot of an ancient dwelling, highlighting the contrast of red rock with deep blue sky. Other technical aspects of the book are not as completely satisfying, but are not glaring distractions either. The plot moves at a deceptively relaxed pace, drawing the reader in with interesting tidbits and wonderful dialog, until the reader is surprised to discover how quickly the action is moving. The conclusion is satisfying both as a resolution to the mystery, but as it relates back to a couple of other issues introduced early on. Liz Adair is a native of New Mexico, lived for forty years in northwest Washington state, and moved to Kanab, Utah with her husband two years ago. She is the mother of seven children and the author of seven novels and a novella.